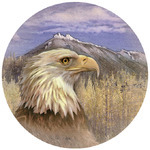 Eagle Gifts - Click on an item for more details! 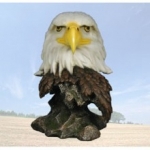 This "Face of Freedom" Eagle Head Sculpture features unparalleled detail and craftsmanship. You are sure to find this exclusive art piece as your treasure trove of unique gifts and decorative accents. A perfect addition to your home or office. Makes a great gift! 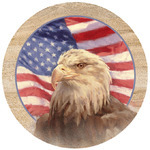 High quality poly-resin, hand painted Length: 9.25"
This "Sentry of Freedom" eagle sculpture features incredible detail with piercing realistic eyes. This beautiful piece of artwork will bring a lifetime of enjoyment to your family and friends. The perfect accent to your home or office. 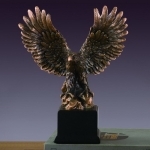 High quality poly-resin, hand painted Height: 9.35"
This Soaring Eagle Sculpture is handcrafted of faux wood with a stunning detail finish. A perfect gift for eagle lovers. This sculpture will bring a beautiful and artistic accent to any home or office. An elegant and timeless piece of artwork that will be enjoyed for a lifetime. Makes a great gift! 8 inches tall.